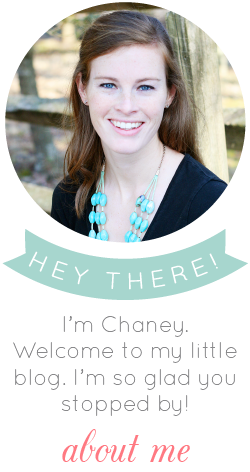 **Announcement: Looking for a unique baby gift (that you don't have to make yourself!)? Take a look at my new line of onesies from CSW Designs! Choose your animal, color and pattern (chevron or polka dot). Perfect for the little ones in your life! Last week I mentioned that seven (count 'em!) of my friends are pregnant right now, and two more delivered baby girls a couple weeks ago. 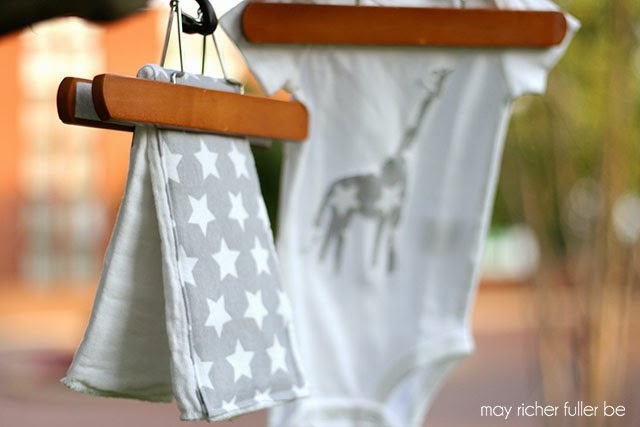 That means there's lots of celebrating to do, so I've been thinking about some budget-friendly gift ideas to welcome these little ones to the world over the next few months. 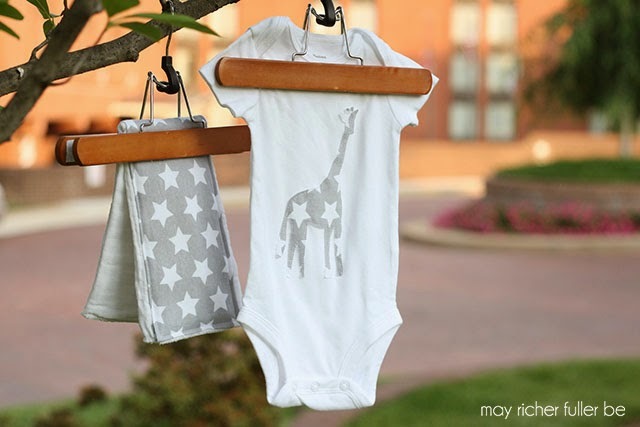 I love the idea of handmade gifts, and one of my favorite ideas so far is "customized" onesies (you can read about several adorable versions in this post from last week). After writing up that post, I got the DIY itch and wanted to try my hand at my own version. So over the weekend, my sewing machine and I had a date and I got to work on a couple of sets of appliqued onesies and burp cloths. 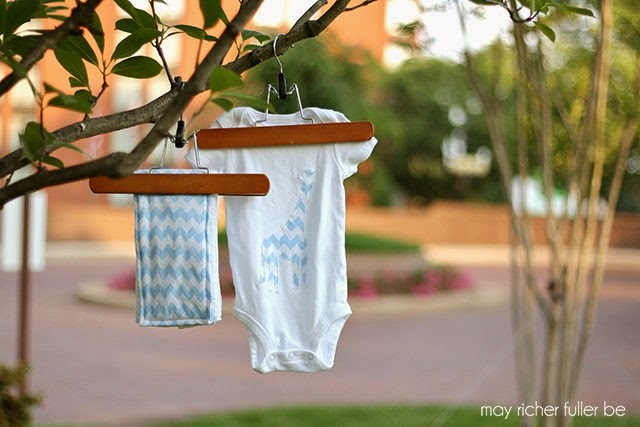 This was my first try at appliqueing anything, but I think they turned out mighty cute, so I thought I'd share a "how-to" in case you're in the market for some handmade baby gifts. 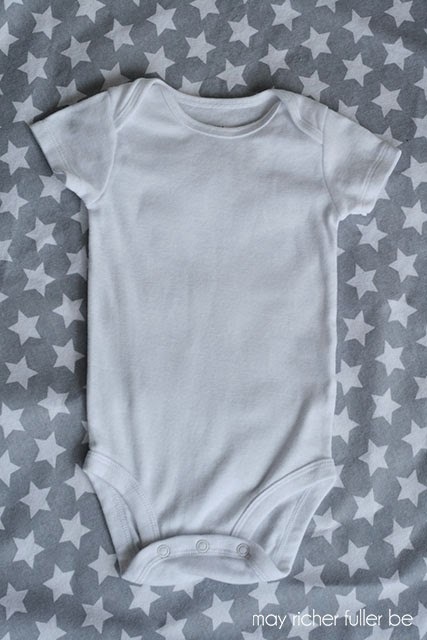 As far as materials go, I bought a four-pack of white size 6-month onesies (Carters "bodysuits" from Target - similar to these). Gosh, I can't get over how tiny these things are - and therefore how tiny the bodies are that go in them! For fabric, I picked out two sets of flannel receiving blankets from Walmart. I can't find a link to these particular ones online, unfortunately. The fabric is super soft, and the patterns are adorable and very baby-appropriate without being too baby - you know what I mean? I washed, dried and ironed everything before starting to avoid any possible shrinkage later on and of course, to make sure they were clean. 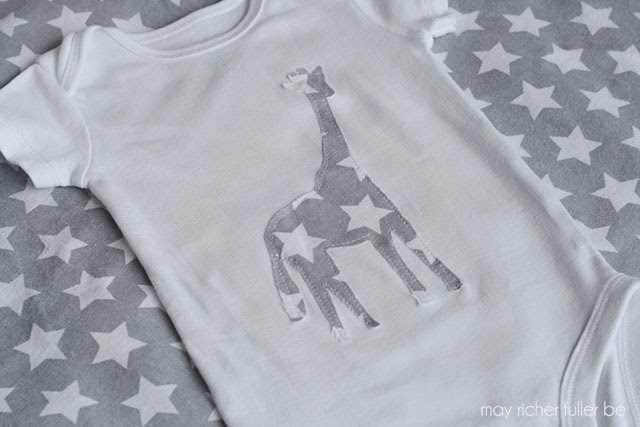 I chose a giraffe for the applique and found a template using Google image search. 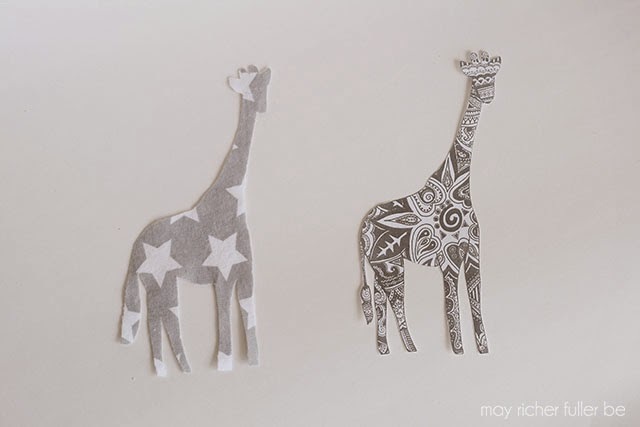 Try searching either "giraffe coloring book page" or "giraffe clip art" for best results. The key is to find a simple shape, even if your shape is inherently complicated (hello spindly giraffe legs). A giraffe was rather ambitious for a first-time applique-er like myself, but I found a simplified one that ended up working out nicely. Once you find your shape, print it out at an appropriate size and cut it out. This will be your template. 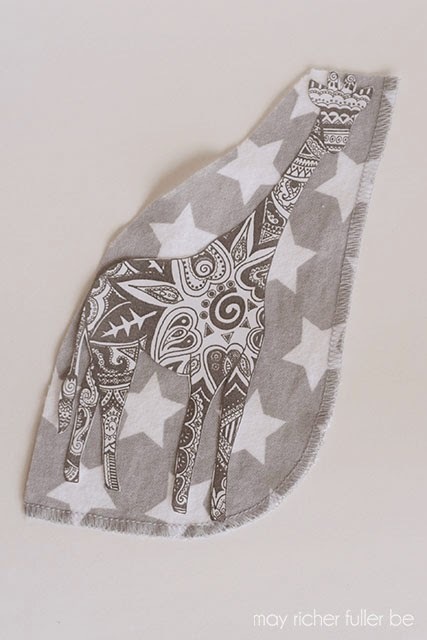 Take your fabric (I chose this gray one with white stars) and cut off a piece that's just a tad larger than the template. It'll be easier to work with than a large piece. Put a couple of pieces of double stick tape on the backside of the template and stick it to the fabric. This will keep the template in place while you cut the shape out of the fabric. Line your fabric shape up on the center of the onesie. You can measure this out, but I just eyeballed it since a giraffe isn't symmetrical anyway. Take some iron-on hem tape (or fusible webbing) and cut small pieces to fit the lines of your shape. I used light duty hem tape, which is practically invisible because it's so light - and I don't have any photos of this step because of that! It doesn't show up well. The light duty stuff worked fine because I knew it wasn't going to be the only thing adhering the giraffe to the onesie. It's really just a way to keep it in place while sewing. Place the pieces between the fabric and the onesie by holding down one area of the shape and lifting up another area to keep it in the right position (i.e. hold the body down while lifting the neck of the giraffe). Following the manufacturer's instructions, iron on the hem tape. Then comes the fun part - sewing!! Actually, this is the trickiest part, but once you get the hang of it, it goes pretty quickly. You do need some basic sewing skills here, so if you're a beginner, I'd suggest starting with an easier shape than a giraffe. Not that I don't think you could do it, but I'm just trying to prevent potential frustration :). First off, the goal here is to sew along each edge of the shape as closely as you can so that it's securely attached to the onesie. For the giraffe, I sewed up and down each leg and around the rest of the body. You'll be able to see the thread clearly the next couple of photos. Make sure you DO NOT sew the front and back of the onesie together. This would make it very difficult for a baby to wear :). Sew continuously around the entire shape. This will provide the most "finished" look. 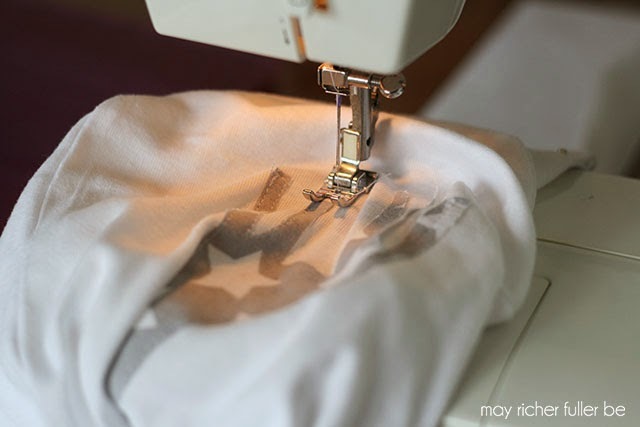 The easiest way to turn corners is to keep the needle in the down position (inserted into the fabric), lift the foot, turn the fabric, put the foot back down again and continue sewing normally. I made a total of two onesies and two matching burp cloths this weekend. All in, I'd say it took me about three hours total, not including the prewashing/ironing step. Definitely worth it for this adorable outcome! I can't wait to give these as gifts! 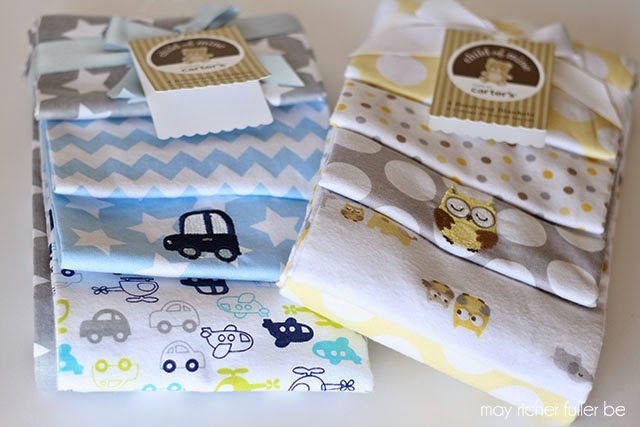 Like I said at the beginning, the tutorial for the burp cloths is coming tomorrow (*update: the tutorial is up! You can find it here.*). These are WAY easier than the onesies. If you can sew a straight line, you can sew these. Promise. Let me know if you have any questions or if I can clarify anything! I LVOE this tutorial! Now I need to learn how to sew! lol! I have a very basic Singer sewing machine that came from Walmart about 8 or 10 years ago I think. It was definitely under $100. It's not the best quality, but it gets the job done for me and has been reliable for all the basics (I mostly sew straight lines, ha!). I hear Brother sewing machines are good too, although I've never used one. Great idea! I've never used Wonder Under - I'll have to look in that. I had the hem tape on hand, and it worked well, but that stuff sounds like it's a little more straightforward to use :). These are too cute! I love the gray and the white! Hope to see you there. Have a great weekend. Thanks so much! Heading over to link up now. Thanks for the invitation :). These were just so cute! 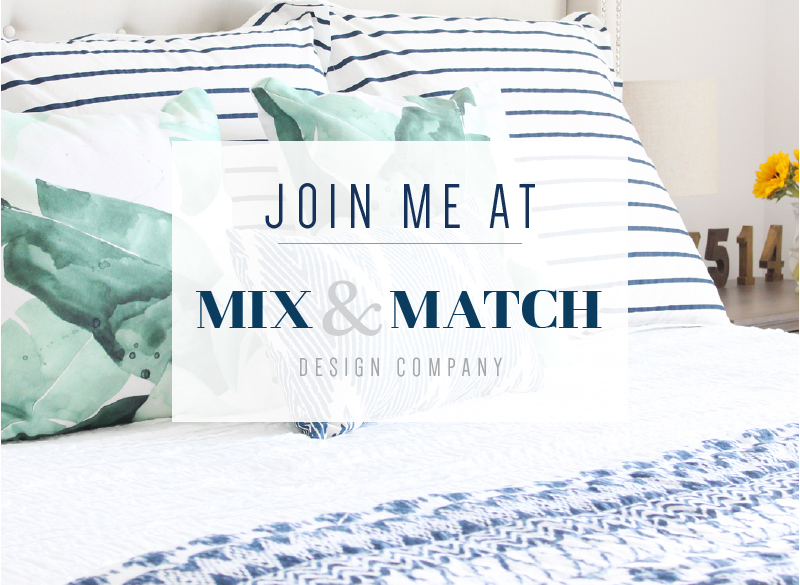 It was my pick for features this week at Give Me The Goods! 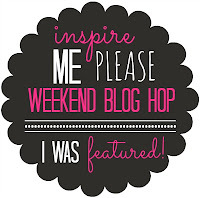 Come by my blog and grab your feature button! Thanks Amber!! 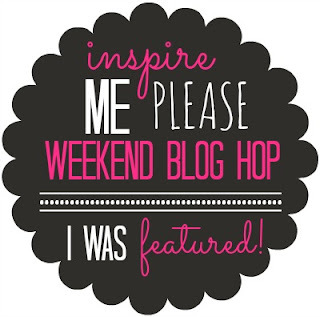 I'm so excited to be featured! Love joining up with your party every week! Thanks, Christina! 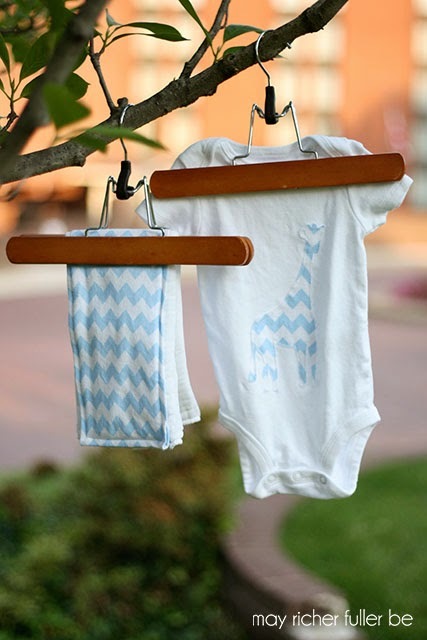 I agree on the heart-melting part - I can't get over how adorable those tiny clothes are :). Love this! Great gift idea! Coming over from House of Hepworths. Thanks for visiting! Glad to have you. 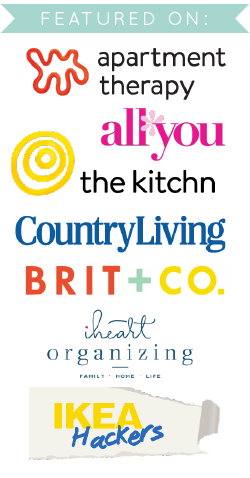 I love House of Hepworths! I just pulled out the sewing machine for some projects. I forgot how much I love to sew. These are super cute. Does the applique end up fraying after a little while from washes and what not? How did you manage to sew with a machine without sewing both layers of the onesie? I think I can contort the onesie to get it done, but not without lots of stretching & bunching... Could that mess up the finished look (like puckering & whatnot)??? You have to do exactly that - contort and bunch up the onesie as you go (slowly!) :). If you take your time, and make sure the area you're currently sewing is smooth, it'll work out no problem! Using the hem tape was really helpful in making sure the applique stayed put while I was working.